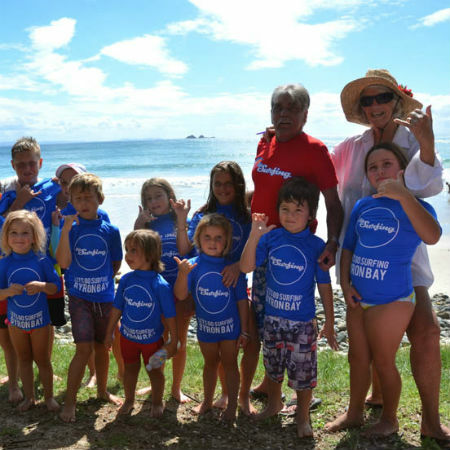 The team at Lets Go Surfing were stoked to provide sponsorship for The Byron Bay Future Legends Surf Competition over the ANZAC long weekend. Lets Go Surfing donated a Rash Vest for each participant that they could wear in the competition and then keep afterwards. Yvonne and Max were fortunate on a number of occasions to spend some time at Makaha in Hawaii with Rell Sunn “The Queen of Makaha”. Rell Kapolioka’ehuka Sunn was a champion surfer and water woman, when her daughter Jan was small, Rell started a contest for kids “The Menehuni” (Legendary mischievous little people of Hawaii, kind of like the Leprechauns) Rell removed the plaques off the many trophies she had won and used the trophies for prizes in her first ‘Keiki” or kid’s contest. With Rell’s help and encouragement we started a similar contest in Byron Bay, known as the “Future Legends” The Future Legends contest is held in conjunction with the Byron Bay Malibu Club’s Classic each year. Yvonne and I were both foundation members of the club and are life members. This year 2017 was the 23 rd. anniversary contest. Each year similar to Rell’s, we write and illustrate a colouring in/story book for each child, with subjects ranging from surfing education, surf safety, surf etiquette to keeping the beaches and ocean clean. Our contest varies a little from Rell’s in so much as we give each child an equal trophy so they are all winners. This comprises of a “Show Bag” type bag which contains a tee shirt, colouring in book, wax, stickers and any other surf orientated goodies we can find. The Future Legends contest is held in conjunction with the Byron Bay Malibu Classic each year. Sadly Rell passed away in 1998 after a long battle with breast cancer, so it is our wish to perpetuate this ocean awareness and water wise idea for kids under 12 that she helped us start and as we adore the little ones with all their enthusiasm and energy, we hope in some way the subtle suggestions and warnings in the little colouring book, which draws on our combined 100 years as water man and woman will help keep them safe by being water wise and allow them to enjoy the wonderful healthy sport of surfing….